My Latest IPAs! Full Tasting Notes, Recipes, and Water Profiles. Sorry for the sporadic updates. 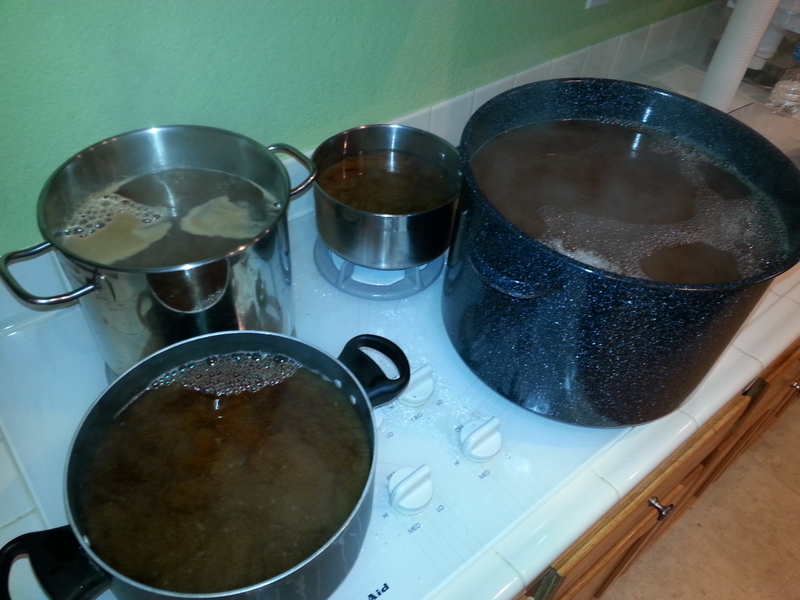 Rest assured my brewing has been cruising along at anywhere from 1 to 3 brews a week. Lately I’ve been tinkering around with the ideal water profile for an IPA and all sorts of hop combinations, grain bills, & yeasts along the way. 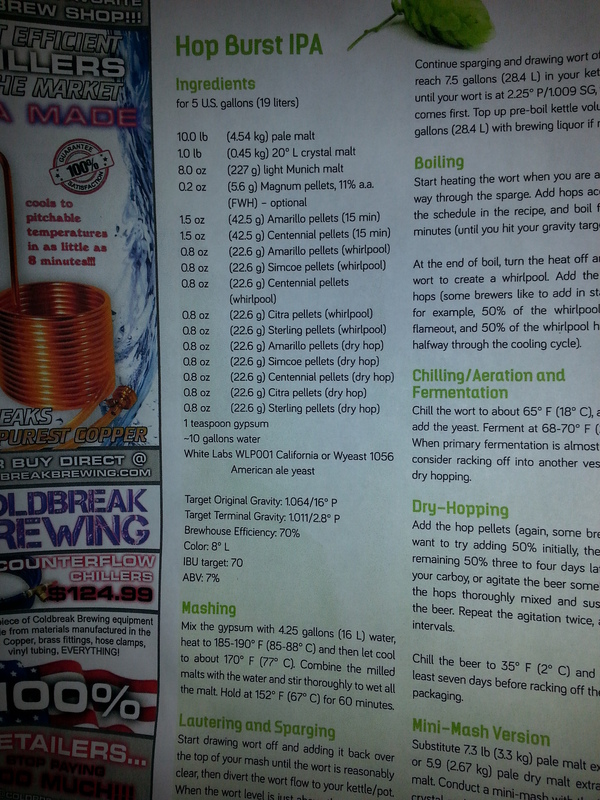 I thought it was about time I put up an update on all the IPAs, recipes, water profiles used, etc. Flavor – Lemony, tangy, mandarin oranges, very light malt presence, finish has some roundness, not a long lingering dryness, not intensely bitter. Very clean with bitter lemon, plum, citrus, & some white grape/winey notes. Recipe can be found here. After Citrus Bomb 1 you must have Citrus Bomb 2! 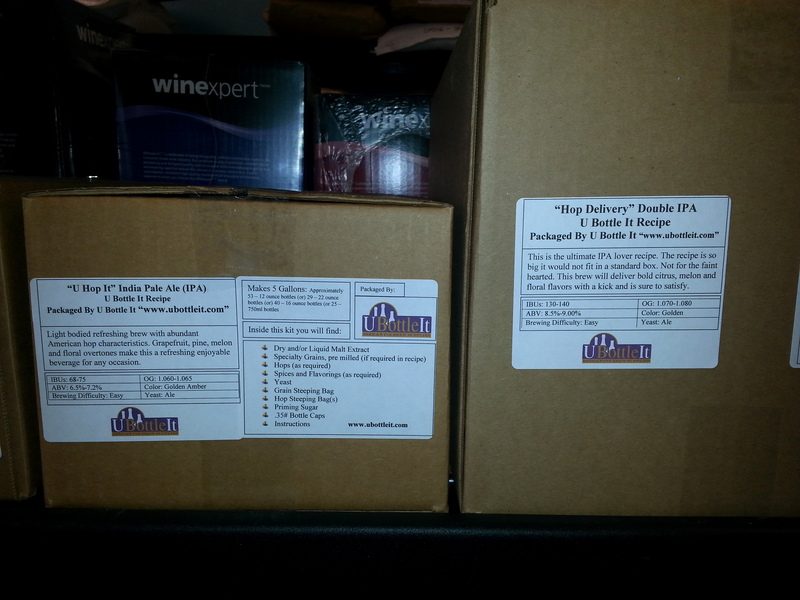 As you’ll recall these were the 2 brews I did for the ‘Average Brewday’ tab. Brewed 12/3. Kegged 12/30. Bottled 1/6. Tasted 1/13. Nose – Fruit, a little dank fruit cup, tropical with piney forest notes, over-ripe mandarin orange, grassy resin. Side note – I’ve noticed Nelson can add some boozy notes that make you think there are fusels or ‘alcohol burn’. Flavor – Dry with slightly minerally finish, some rich fruity notes – dries out to very clean finish. Might need slightly more malt backbone for Tasty McDole’s water profile. White grape winey notes with dank undertones. Aroma – Rich danky fruit, tropical and floral spicy resin. Light mandarin orange – very Enjoy By-ish with no one signature hop but plenty of hop character. Light pineapple as it warms. Flavor – Danky spicy resin. Fruit with an immediate dank punch, pleasant but light malt, lingering dryness. No doubt this is an IPA. No ups and down in the flavor wave – just a deliberate hop punch. Purring Kitten 5 Session IPA should also get a mention because it’s delicious. Brewed 12/9. Kegged 1/6. Tasted 1/13. Aroma – Rich pineapple, cherry, complementary malt – like a bright fruit cocktail. Some plum, nose is big and bold. Carbonation level makes a big difference on how well this one pops. Flavor – Balanced hoppy finish. Doesn’t taste 4%. Light bodied with a clean finish & not terribly long dryness. A lingering slight biscuit note with strong hop flavor. The fruits of all of this brewing labor have been wonderful and intoxicating. I sent a few of these beers off to competitions and I’ll be sending more soon. I’ll be sure to update on how everything does. For the sake of water profile comparison here’s an excel sheet: WaterProfiles01-15-14. At this point, if you put a gun to my head and made me take one of these water profiles for IPA brewing eternity, I’d take the ‘Safe Play IPA’ water I put together for Citrus Bomb 1. I think it’s well-geared for IPAs but I get the impression it would stand up better to both West Coast hop bombs and a little more malt-forward takes on the style. The Tasty McDole profile with higher sulfates was quite nice on Thirst For Burst but a little over the top (it seemed) on Citrus Bomb 2. Obviously grain bill, hopping, mash pH, yeast, etc can play huge roles as well….and probably did. Dialing in a water for the specific beer you’re crafting looks like the ideal way to go to me. I’ve already re-brewed Water Tweaker with slightly more aggressive water, slight grain bill tweaks and Simcoe in the mix with the Mosaic & Nugget. I also plan to continue pursuing hop bursted IPAs like Thirst For Burst, as I’m a big fan of Stone’s brand of hop bomb and I think that immediately ushers you into the ballpark. Time to keep scouring the interwebs for more water knowledge. Until next time friends. 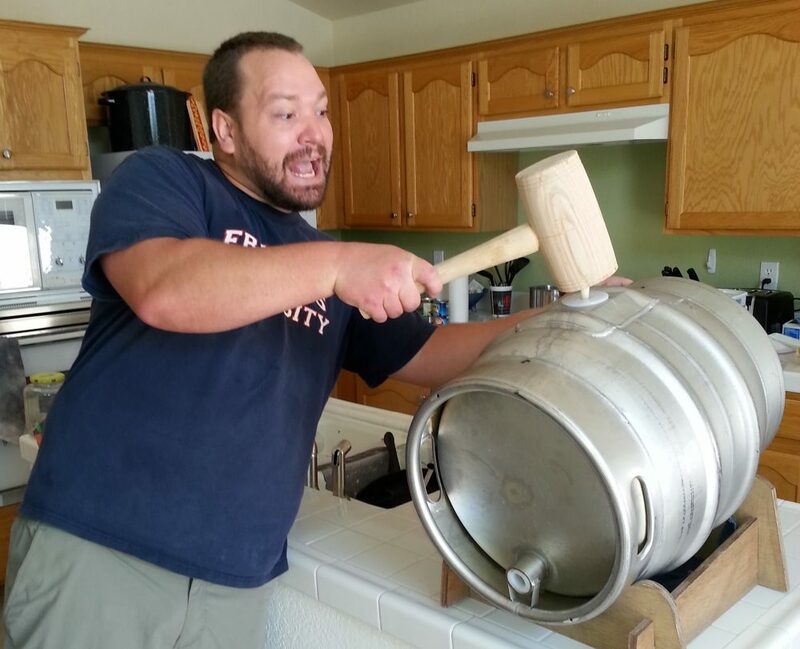 In my last update I laid down the gauntlet for myself and decided I was going to max out my entries for the Nevada State Homebrew Championship. Nevermind the fact that most of the beers weren’t brewed. 1. Purring Kitten Session IPA – Because I wanted to use the 2 three gallon carboys this batch was in and I’d heard Jamil discussing the surface area benefits of double dry hopping, I transferred both the WLP 002 & 006 sides to kegs and added Mosaic & Citra hops (as well as Biofine). The Kitten will be a slightly different animal than last time with the higher gravity & added hopping. I didn’t taste the beer but both sides smelled like hops were making sweet love to my whole olfactory situation. 2. Helles Too Good For You is still lagering away happily. Color looks good. For some reason I have total confidence in the 4 different lager yeasts I blended for it. I transferred the previous Helles batch that was on Big Dog’s Imperial Pilsner WLP 830 yeast and it tasted nice. Fairly dry and a touch bitter but good malt aroma. 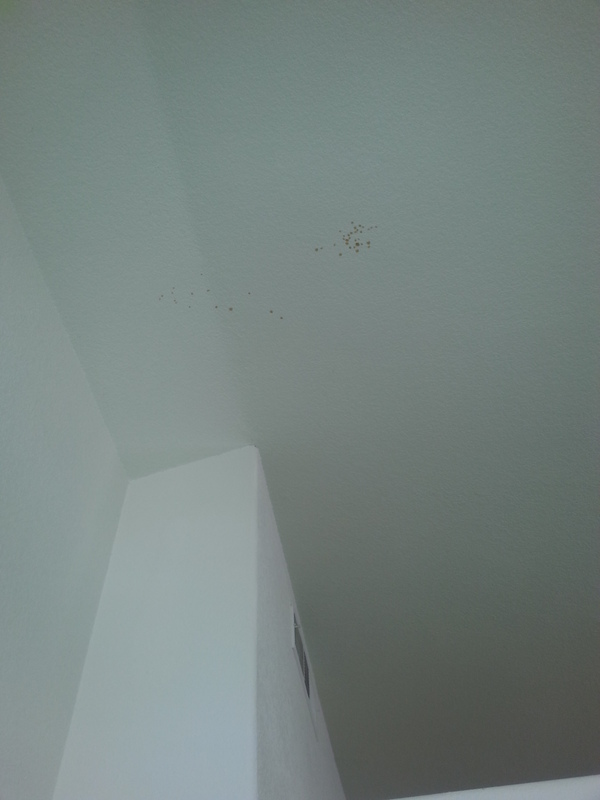 Those spots are yeast and hops on the ceiling. We have very high ceilings. It’s probably at least 15 feet high at that point. I figured running the Wit II at a fairly well-controlled 67-69 with ample head space would take care of things. No need for a blowoff tube. Man was I wrong. If you ever want to murder someone by fermentation, fire up some well placed Wit II fermenters and give it a day. 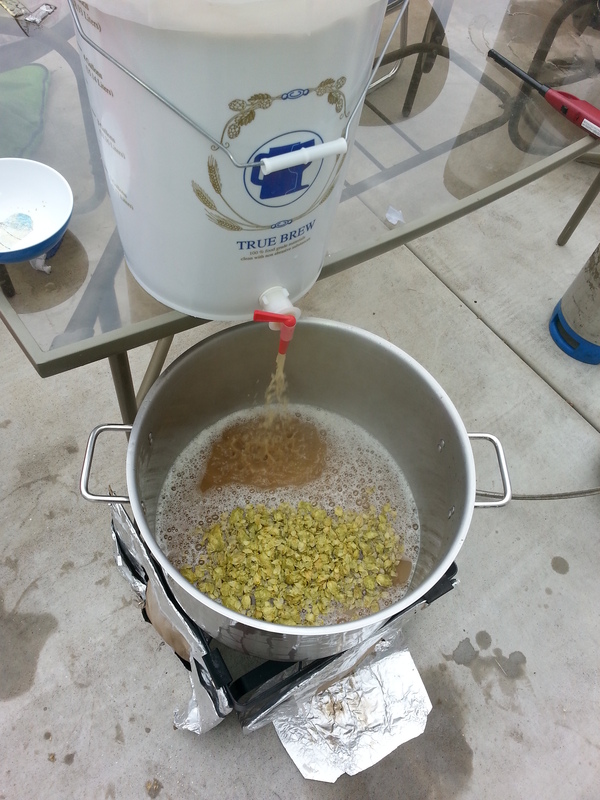 Regardless, I have high hopes that the Belgian IPA on the WLP 400 Belgian Wit will be delicious. Figuring out the hopping was a little goofy, but luckily I only needed to hit it with 1oz EKG. My volume and gravity ended up pretty money and the wort smelled and tasted great, so we’ll see what the split of WLP 530 Abbey Ale & WLP 575 Belgian Style Blend can do with it. I chose those 2 because the 530 will be more dry and spicy and the 575 should be a little more ‘general Belgian’. It’s hard to know which side I should put my money on for coming out the best. 5. Kohatu For Dummies Pale Ale – I brewed this beer today and I think it has real promise. The Kohatu is 6.8 AA and not super over the top but it definitely has some intriguing pine & tropical notes. It’ll be fun to see all 50 IBUs of it shine on a pretty stripped down pale ale base. Unfortunately WLP 001 California Ale has been in high demand at U Bottle It lately, so I went with the 2 vials of WLP 006 Bedford British I was saving for a potential session IPA re-brew. I figured that if it worked for Purring Kitten, it’d work in the hoppy pale. 6. Wag The Dog Northern English Brown – This beer has still not been brewed. I’ll be brewing it tomorrow after work on either WLP 005, 006, or 041 depending on availability and if I’m in the mood to split it and acquire more 3 gallon carboys. Funny enough, I got up at 6am and brewed this beer (and obviously first wort hopped) and on my way to work in the afternoon I listened to Jamil’s latest style show on Double IPA. It turns out Jamil makes very solid points on why he thinks the practice is total BS and I have been converted. No more first wort hopping for me unless it’s a big Double IPA where I’m cramming hops everywhere I can. Anyway, I’ll give detailed recipes and notes on anything that wins or scores well. Also, there’s another contest coming up through SNAFU that I already have 7 entries in. The SNAFU competition will consist of 2 categories: Best ‘big’ beer (OG over 1.060) and best use of hops. I’ll be sure to share more details as things develop. 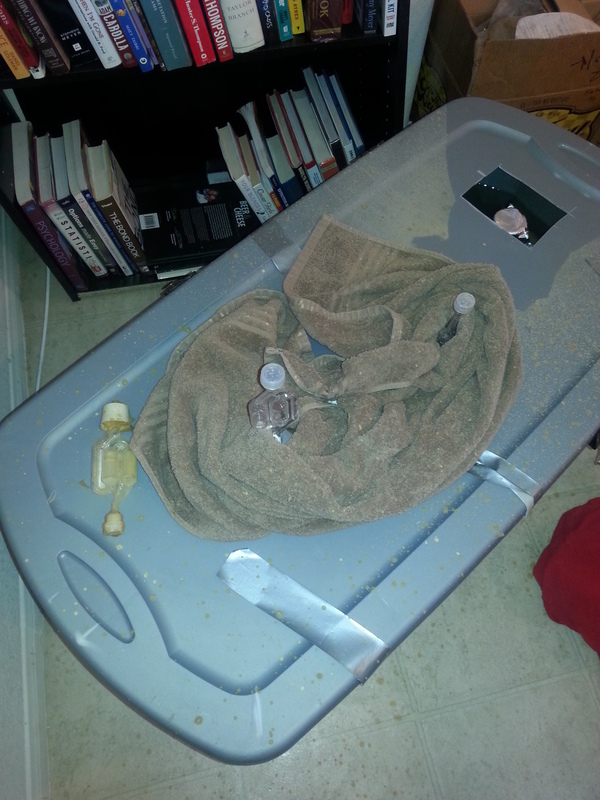 I’m planning on trying to uncap, re-yeast & prime a few bottles of both my Throw Up The Dub Dubbel & Agnostic Tripel. Both beers are about 15 months old and taste quite nice, other than their continuing lack of carbonation. Other than all these competition beers, I’ve been scheming up a Nelson Sauvin hopped Oatmeal Belgian Blonde which I might brew at Clyde’s on Sunday. I’ll either do that on Wyeast 3711 French Saison or White Labs 500. I also need to brew a Berliner Weiss sooner rather than later because I want it in my kegerator and I need to perfect a recipe for my wedding in March! Alright friends! I’m tired from early brewing so I’m headed to bed. Be well and prosper!